Looking for a holiday gift idea that doesn’t cost a lot of money? And is meaningful? Me too! This time of year can get crazy budget-wise because there are so many people we genuinely want to do something nice for. Enter the Kindness Cookie Plate. 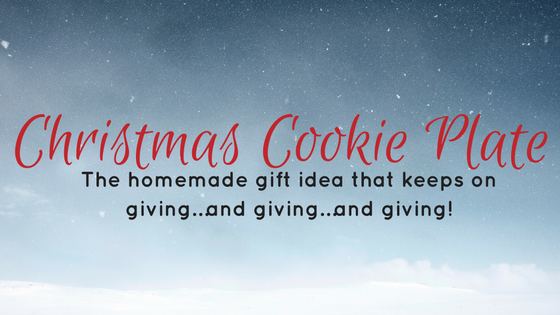 The homemade gift idea that keeps on giving…and giving…and giving! The idea behind the kindness cookie plate is that each recipient gets to enjoy a special treat and then refill the plate and pass it on to someone else. It’s a great way to spread holiday cheer (anytime of year) without spending a lot of money. You’ll be amazed at how much cheer one little plate can spread. They can be hard to find but it’s so simple to design and create your own to give out to your loved ones this holiday season. Clean the plate thoroughly with the rubbing alcohol so the marker will adhere. Once its clean be careful not to touch it or the marker won’t stick where your fingerprints are. Prep the pens according to the package directions and use them to write on the plate. Once it’s ready fill with yummy Christmas Cookies or other fun treats and gift it to a special family. After they enjoy the treats they can gift it to someone else without having to spend a lot of time or money–which is a great to gift in itself! Ok, this idea is pretty genius! I’d love to just pick one up at the store, but it’s nice to know I can make one without too much difficulty. Definitely a tradition we’ll have to start! This is adorable and I LOVE the idea behind it. This would make such a great holiday gift for grandparents. I know my mom would love to receive one from the kids! What a fun idea for the holidays, a cookie plate! I love DIY gifts to make with your family! what a cute plate. We have a special plate and cup just fro Santa to enjoy on Christmas eve. We always leave his cookies and milk on them. This year we may even leave reindeer food. This is such a great idea. It would be such a cute thing to do with the neighbors! What a nice idea! 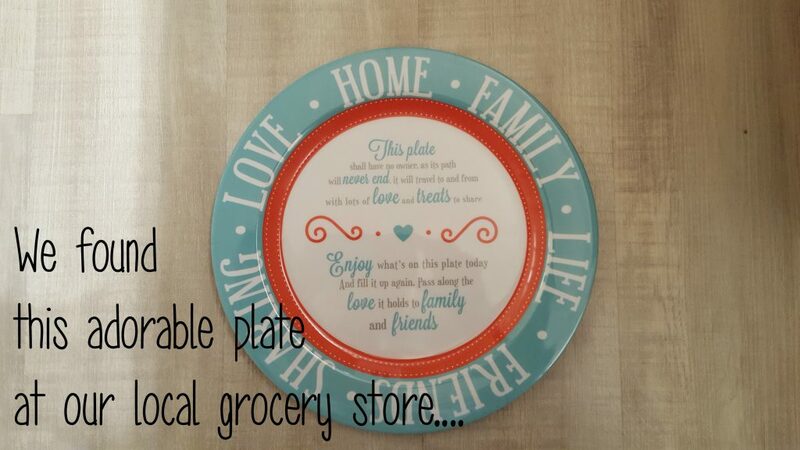 I used to buy customized plates and they cost almost $20! I just got one and never tried it again because it’s kind of expensive for just a plate. With this ‘craft’ I can probably do 5 or more at the same price! Thanks, I never would have thought about it myself. LOL! I love this idea! It’s so cute. Thank you for sharing! This would be a fun idea for a holiday gift! I would like to remake this myself. what a cute plate! I’ll have to keep my eyes open for this the next time I run to the store, great idea! I love the idea of a cookie plate that gets passed on over and over again. I can’t wait to make one for my daughter. That plate is so pretty! I’ve never tried creating a cookie plate. Sounds like a lot of fun. Thanks for the idea. What a great idea! As a teacher these would be great for kids to make in school too , of course no baking during the day but afterwards it could happen. This would be great for birthday’s too. This is such a pretty plate. Such a great holiday option! Loved it! Love this idea, the kids can get involved! Each plate can be individualized for each person. True gift from the heart. I love gifting baked goods to friends and neighbors. This plate would bring my gift up a notch for sure. We have a special plate for Christmas cookies that I pull out every year. The kids love making Xmas cookies together. omg I love this!!!! baking is one thing my daughter and I love to do!!! we will have to make a cookie plate!! This is a cute idea! I’m not sure why I’ve never thought about doing this before! This is a great idea. One of my daughters did this last year in school and it turned out so good. I would love to make these with my girls this year. I can think of a bunch of uses for this technique. I will have to get the supplies I need to make some this weekend. This is a pretty plate. I feel like my plates are great for the holidays. They are red but adding a saying to them would be fun. Such a cool plate. Looks like I want to have a personalize plate. I love this idea! We always bake treats for our friends and neighbor’s, so giving them a cookie plate to go with them would be so sweet! Thank you for the idea! This Christmas cookie plate does not look too hard at all! My daughter would love to help me with a project like this. It is so nice to pull it out each year and create new memories. We have a cookie plate too! I love it – we’ve had it since I was little – and it’s so important to us to use it every year! It’s just one of those traditions you look forward to each year : ) So much fun! I LOVE this idea! I bake for so many friends and would love to have it be on a memory plate instead of a plastic container. This is wonderful! Seems so easy too! This is so cute and creative plate. Perfect gifts for Christmas. I love your ideas. What a cute cookie plate. I had no idea this is so easy to do. I can’t wait to try this project. This plate is so unique. One of my passion is to make diy. I will add these creative design on my list.. Thank you for sharing this. This is a really cool idea. Anything where you are being kind to someone, then asking them to pass that kindness along is a great idea. And sharing cookies/sweet treats with others is always nice, then add the sweet plate that you purchase already decorated or do it yourself, phenomenal! This is such a cute idea! I absolutely love the way it’s meant for this special event on Christmas Eve. It makes it so worth while and something the kids will always remember! I love this idea of passing it along. I just don’t know if I’m talented enough to make my own. What a great saying on this plate!!! I love to share baked treats with our friends and family this time of year! What a great idea! I can think of so many other occasions to custom make a plate like this! This Is Adorable, I Must Make With The Girls They Will Love It Thank You! I love this plate! It is so gorgeous! This is a fabulous Christmas gift for friends and neighbours! THis is such a cute idea. And the best part is how simple and cost effective it is! That is so cool! I love how easy it is to make and how good looking it is. It looks like a store bought item. what a cute plate. We have a special plate and cup just fro Santa to enjoy on Christmas eve. We always leave his cookies and milk on them.